Time to cut through all of the chatter. The .300 Blackout (BLK) has been called everything from the 5.56 killer to the black mamba. It was designed by Advanced Armament Company (AAC) to be a replacement for the MP5SD, a 9mm sub-machine gun favored by special ops. But it had to have more power, the same sound level, and compatibility with the M4/AR-15. The 300 BLK did exactly that…and gave us civilians a serious upgrade for the AR-15. But just because it’s there doesn’t mean it’s necessary. We’ll look at the ballistic, costs, and real-world killing power of the .300 Blackout vs 5.56/.223…plus our recommended uppers & ammo. To really understand why the .300 BLK round is such as step forward you have to understand the AR-15. The AR-15 is the most popular sporting rifle in America because of its ease of use and customization. If you want to know everything about the AR-15, check out our Buyer’s Guide. The 300 BLK gives the AR-15 the ability to shoot a much larger bullet (similar to the 7.62x39mm round used by the AK-47) by switching out the upper receiver. No changes are needed to the lower receiver or even magazine. If you want, you can switch out only the barrel since the bolt will stay the same. First on the list is that to fully burn the 5.56mm NATO powder charge requires at least 12″ of barrel – without those 12″ you’ll get a massive fireball as the round leaves the barrel with every shot as the unburned powder exits and explodes (although awesome to see, there are some major downsides to this – especially in combat). Because of the 12″ barrel requirement, adding a suppressor isn’t a great option often since the suppressor adds another 5-8″ onto the end of your rifle. If you need a super short, handy rifle – you can do better than an AR-15 chambered in 5.56mm NATO. The .300 BLK has its origins in the .300 Whisper, a round designed…as the name suggests…to be shot suppressed. The case is formed by stretching out the case of a 5.56mm NATO and trimming it down slightly. It is then stuffed with fast burning powders and any number of bullets weighing from 110-220 grain. What you have now is the ultimate short range thumper that will feed both supersonic and subsonic ammunition and get its full ballistic potential (complete burn of the powder) from a 9-inch barrel. The .300 BLK is really what two long protracted wars in the Middle East have taught us about what is needed in the average modern gun fight. A hard-hitting, short, light, and quiet, gun that will own 0-300 yards. The AR-15 with .300 BLK does this markedly better than the 5.56 but doesn’t always beat it out for every job. Both .300 BLK and 5.56mm NATO are an intermediate class rifle cartridge for target shooting, hunting, home defense, and plinking. However, they both have their strengths. The 5.56mm is half the cost of 300 BLK and is available in more high-end loading suitable for precision rifle fire. The 5.56mm also shoots flatter, has less recoil, and the ammunition weighs about 40% less. The 5.56mm is also safer for use inside a building for home-defense because the rounds tend to key-hole or break apart upon impact. The .300 BLK has a wider range of projectile choices, thanks to the .30 caliber bore, burns its full potential in a 9-inch barrel, and is a much better choice for hunting. It also has the ability to cycle both super and subsonic ammunition without modification. The .300 BLK shows its strengths when short barreled rifles and silencers are involved as well as when barrier penetration might be needed. For a duty rifle that will conduct CQB work, this cartridge is a godsend. 5.56 20” Barrel 55gr 3100fps 0”/ 919 ft. lbs. -3”/ 711 ft. lbs. -12”/ 542 ft. lbs. 5.56 16” Barrel 55gr 2800fps 0”/ 742 ft. lbs. -4”/ 567ft. lbs. -16”/ 426 ft. lbs. 300 BLK 9” Barrel 125gr 2100fps 0”/ 993 ft. lbs. -8/799 ft. lbs. -29”/ 641 ft. lbs. 300 BLK 16” Barrel 125gr 2240fps 0”/1312 ft. lbs. -5.9/1068 ft. lbs. -21/ 882 ft. lbs. 300 BLK 9” Barrel 220gr 1000fps 0”/461 ft. lbs. -35”/ 437 ft. lbs. -109”/ 416 ft. lbs. In the table above you can see the compared ballistics of both the 300 BLK and the 5.56 NATO. 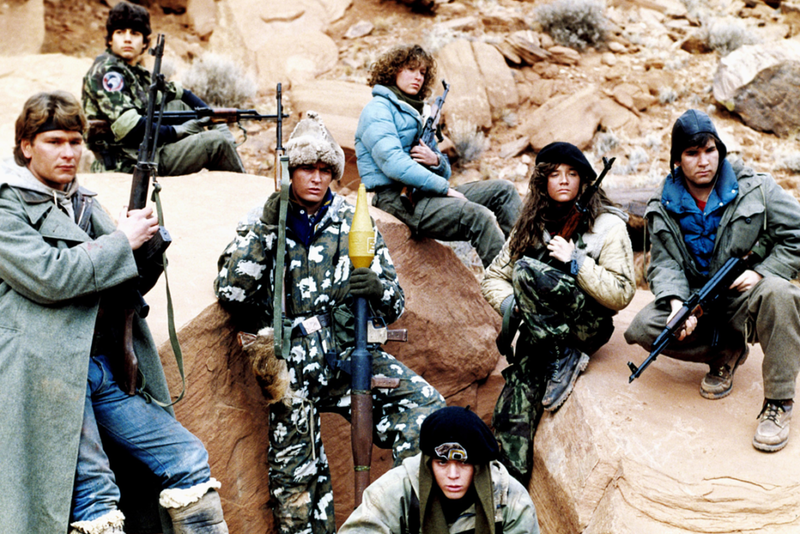 It shows the barrels that the cartridges were designed around…20-inches for the 5.56, 9-inches for the .300 BLK, and the most popular civilian barrel length of 16-inches. Exterior ballistics are the qualities associated with how a projectile flies through the air. 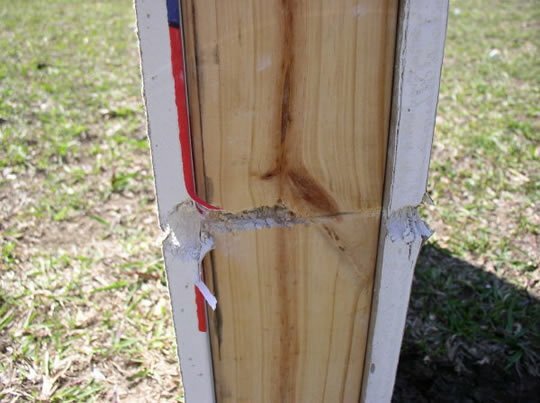 The wind drift, bullet drop, and zero range all fall into the category of exterior ballistics. You can see above that the 5.56 is significantly flatter than the 300 BLK in flight. The .300 BLK uses bullets with a higher ballistic coefficient but isn’t moving fast enough to take advantage of its sleeker projectiles. This is why the 5.56 shoots flatter and with less wind drift despite having almost half as much energy. The round’s sectional density, the relationship of its mass and its weight, its ability to penetrate rather than fragment, and the wound channel it creates due to its bore size are all the study of terminal ballistics. To the untrained observer, the 300 BLK seems to have the edge in terminal ballistics. The stouter bullets, with more mass of a larger caliber, seem to be the more effective round. While the .300 BLK does have slight obstacle defeating capabilities it isn’t markedly better in performance than the 5.56mm with the correct loading. Modern bullet design is closing the gap between calibers and making the smaller bores more and more effective. Additionally, the 5.56mm NATO was designed to break up, tumble and flip end over end when it encounters a target. This is called high-velocity projectile fragmentation and deformation. All varmint style bullets follow this, and for bullets designed for Military or Law enforcement, it’s very effective. 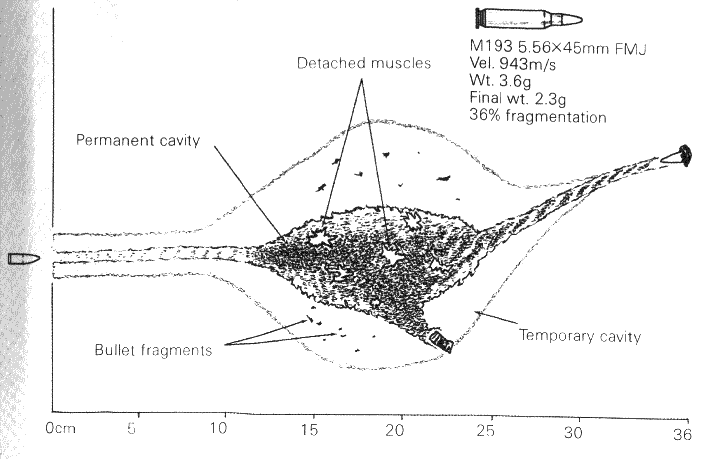 Any of the stories you hear of the 5.56m NATO “poking holes in people” come from the steel core M855 round that was designed to defeat Soviet body armor. Any of the civilian and all of the premium bullets designed for the 5.56mm are good to go. As far as a clear-cut winner goes, it’s hard to tell. Depending on what you need the round to do, it’ll do it well. The speed of 1,125 fps is important because that is the approximate speed of sound at sea level. 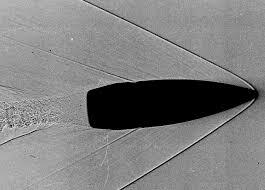 When a bullet travels faster than the speed of sound the bullet makes a crack, called a sonic boom. This sonic boom is about half of a gunshot sound; the other half is from the explosion of the powder, and a little bit the mechanical action of the rifle cycling. 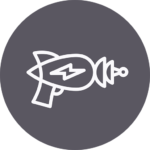 The silencer (or suppressor) controls the explosion but has no effect on the sonic boom, which makes a silencer less effective when used with supersonic ammunition. If the goal is to have the quietest gun possible you need an effective silencer and subsonic ammunition. This is a great combination for a home defense gun but terrible for anything past 50 yards or so. 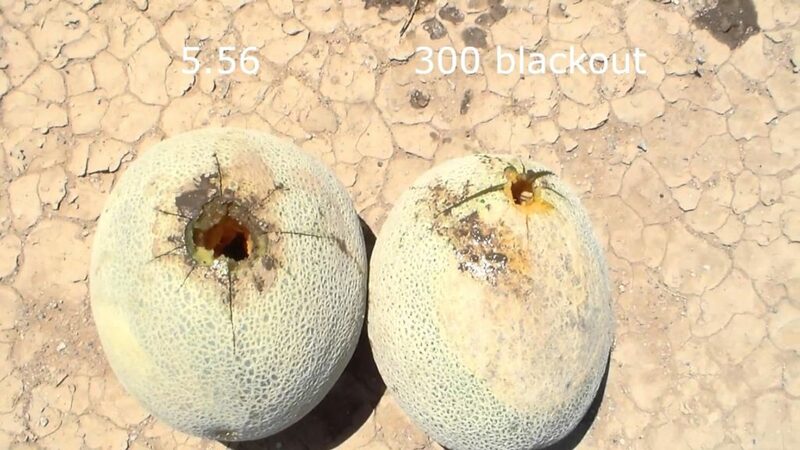 The reason being is that a 220gr bullet traveling at 1000fps is essentially a .45acp. You should never hunt with subsonic 300 BLK ammunition as not only will it not get the job done…you’ll more than likely lose your animal. You can’t count on the trajectory or the penetration of the subsonic ammo to place an ethical shot on a game animal past bad breath distance. 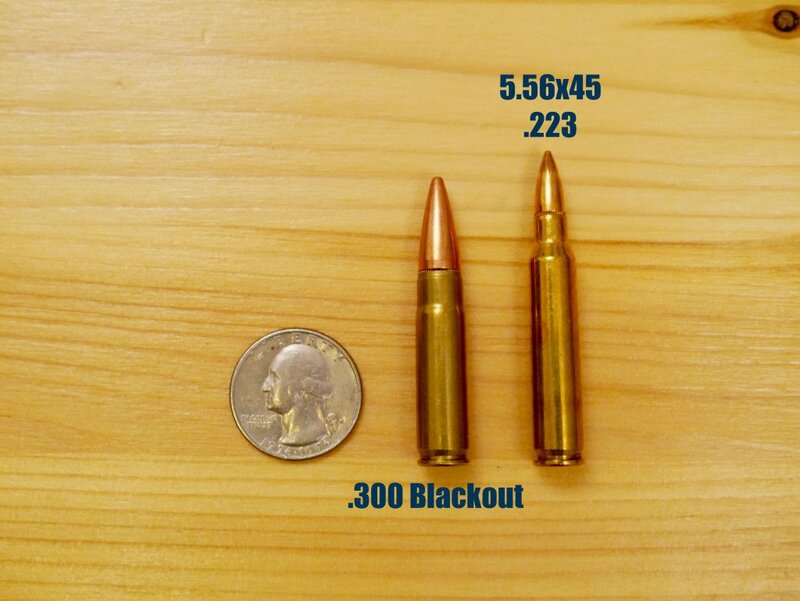 Stick to the supersonic 150gr or 125gr bullets and you’ll identical performance to a .30-30 or 7.62×39. This is the section where you let random “experts” on the internet make recommendations on what you should shoot. Target shooting, training, or informal plinking, shooting is just plain fun. It can get expensive so this part goes to the 5.56mm. The .300 BLK’s benefits just aren’t needed when all you’re doing is punching paper. Look for bulk cheap 5.56mm and use it and if you feel like you need to, switch to .300 BLK when the time comes. 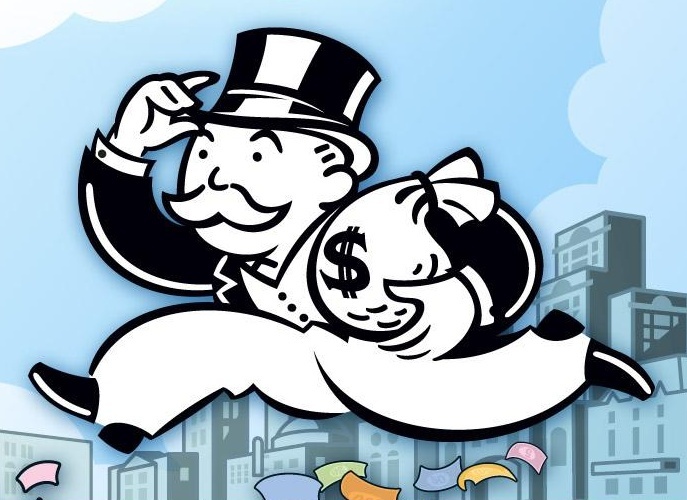 Or if you’re Mr. Money Bags. Your home is your castle and for keeping the peace you should walk softly and carry a rifle. .300 BLK and 5.56mm both have their pros and cons in this area and what is best for one person, may not be the best for another. .300BLK best selling point is that it was designed for use with a suppressor and a short barrel – both of those are great for home defense since a short barrel makes it easier to move around your home and a suppressor means not damaging your hearing (and the hearing of any loved ones or pets in the home) if you need to use your weapon. Sounds kind of perfect, doesn’t it? Well, sadly, it isn’t. A major downside to .300BLK in home defense is that due to the larger bullets and their weight they have a lot of barrier penetration. Meaning that if you miss (or even if you do hit your target) there is a very good chance those rounds will carry through wall after wall after wall. Over penetration makes .300 Blackout a very poor choice for anyone living in an apartment, have neighbors close by, or live in a state that restricts access to NFA items like suppressors. On the other hand, 5.56mm has poor barrier penetration (it will still go through several layers of drywall, but loses effectiveness much faster than .300 BLK), and…well that’s about it. For home defense, it is still best to have a short barrel and a suppressor – assuming you live in a state where you can get them and have the desire to do so. The answer to which caliber you should take hunting is a trick question. With modern bullet designs, the gaps between the killing power of calibers are shrinking. But what and at what range you are hunting are the primary factors in what you can ethically hunt with. If your quarry will include only small game, predators, or mid-sized deer at ranges inside 100-150 yards then go for the 5.56mm. The wide range of factory loading designed for hunting and featuring soft or ballistic polymer pointed rounds, the 5.56mm is a decent pick for hunting at short to mid ranges. If you plan on hunting medium or large game such as deer, hogs, or smaller bears, the .300 BLK is far superior. The extra mass gives more reliable penetration than the 5.56mm and the typical hunting ranges of these animals mean that the slight disadvantage of the trajectory is negligible. However, if you’re looking to hunt any game at distances greater than 150 yards or game larger than an above average white tail – you should look at cartridges with a little more oomph to ensure ethical kills. Uppers available for cheap online can make your weapons much more versatile. The best options to shoot both calibers. Because the .300 BLK is derived from the case of the 5.56mm, all you have to do to switch caliber is to change the barrel. In an AR-15 the best way to this is to get another upper receiver. Keep all your mags, your high-quality bolt, use the lower receiver you have, and take advantage of both cartridges. Now…how about what upper to get (because remember, it runs on a standard AR-15 lower)? We have a whole article dedicated to the best .300 blk uppers, but these are our top 3. Our favorite upper of the moment is Aero Precision. We love their 5.56mm version (review) and recommend their .300 BLK offerings. Another great option for a rifle barrel length upper come from Brownell’s with their exclusive line of .300 BLK complete uppers. 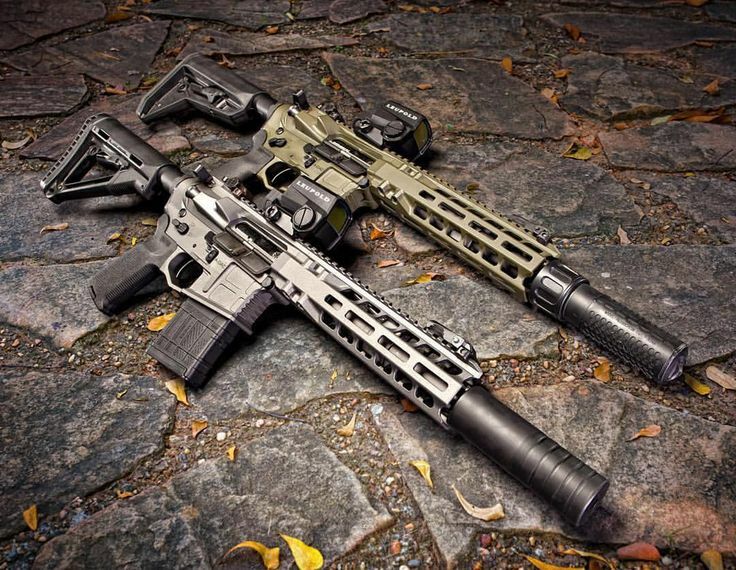 PSA also has a complete line of uppers both with and without BCGs and charging handles and ranging from pistol length 7.5″ barrels to 16″ rifle barrel assemblies. You guessed it, we have a great article on .300 Blackout ammo that is very much worth reading – but these are two of the best! Top of our list for all around Supersonic .300 BLK is Barnes 120gr Vor-Tx offering amazing penetration and expansion. and for subsonic we love the Remington Express subsonic. The .300 BLK won’t ever supplant the 5.56 for the most ubiquitous AR-15 cartridge but it does have some key areas where it really shines. Chime in below…who can think of a time where you wish your AR-15 had a little more juice? If 300 blackout has 2x the power of 5.56 @300m, why is 5.56 better at lang ranges? You’re talking more killing power at longer ranges. Despite an extra 3″ of drop-arguably negligable. 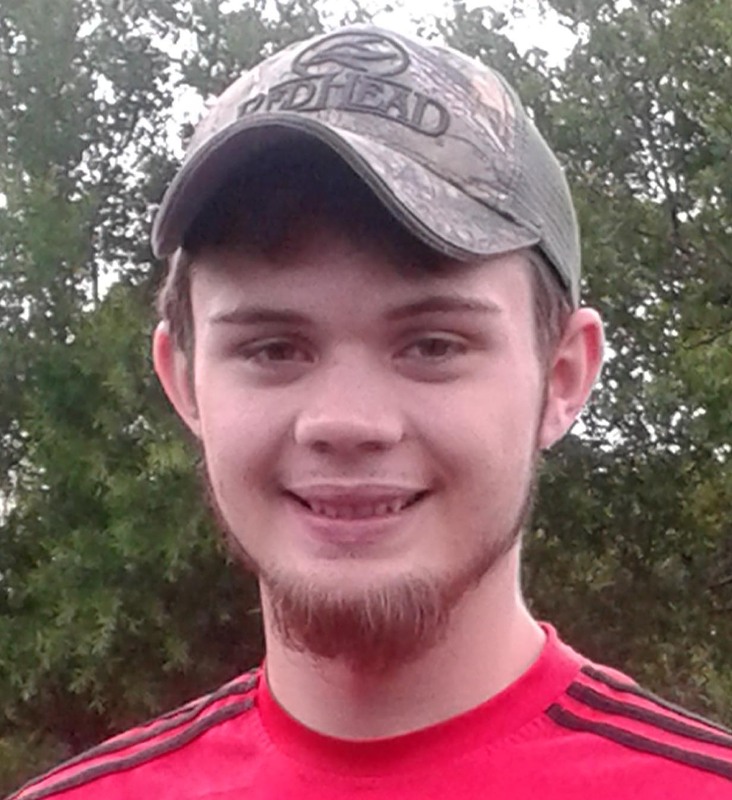 This article seems to be almost word-for-word an article in the American Shooting journal, but I don’t see your name on that. Did somebody plagiarize somebody else? Thank you for alerting us, it looks like they’ve posted a bunch of our articles. I’m counting almost a dozen so far. Or… why would you care if an enemy combatant writhes in pain before they die? Many rounds that are effective on humans are not ethical on game animals. lol like most you have no idea on the 300BLK origins. It’s a 221 Fireball necked up. A 5.56 stretched and the 5.56 is much longer to begin with?